Aaron Mak was my client for a 10-month project at the port of Hong Kong. He was bright and generous. 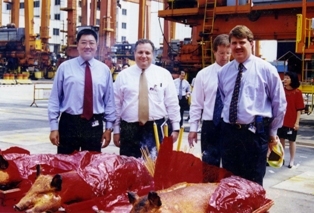 He became CEO of Hutchison’s Shanghai Operations, but passed away of cancer too soon. Singapore port operator PSA is mourning the loss of Aaron Mak, managing director PSA China, who died in Shanghai last week. He was 56. Mak was responsible for all the PSA Group’s activities in China and brought many years of expertise in the port industry with him when he joined the group in January 2004, PSA said in a statement. During his tenure with PSA, Mak was instrumental in leading the expansion of the world No 2 port operator’s presence in China. Under his astute leadership, PSA’s existing port ventures on the mainland grew from strength to strength. Additionally, Mak successfully led the acquisition of several new port projects in China, namely in Fuzhou, Tianjin and Dongguan. Today, PSA has a total of seven port projects in China and Hong Kong. Vincent Lim, CEO Northeast Asia, will concurrently oversee the duties of PSA China. Gallery | This entry was posted in In Memoriam and tagged aaron, Hong Kong, Mak, port, Shanghai. Bookmark the permalink.